Halyard Purple Nitrile Exam Gloves from HealthyKin.com were designed as an alternative for those who may have a Type 1 hypersensitivity to natural rubber latex proteins. The unique color purple provides quick, visual differentiation from those of other sources. The custom design enhances comfort and fit, and textured fingertips improve wet and dry grip. I must agree with the 9/12/13 reviewer. The company provides astonishing fast service on a product that is the best on the market for protecting my hands through all cleaning tasks using chemicals or detergents. Great glove for any purpose around the house, almost never leaks and has excellent tactile properties. I was introduced to this glove in the Clinical Laboratory. When the requirement for us to wear gloves came, I immediately had problems with the typical latex gloves. I tried liners for a while but they made my hands perspire just as much...the gloves just came off more easily. A while later....the purple gloves appeared and I have been sold on them ever since....a good many years now. After retiring I continue to order these for general hand protection tasks. Often I can even re-use them. The delivery is astonishingly fast. These are THE best !! I use these in the lab and I use them at home too. Bought a case and lightning fast shipping! Thank You. I'll be a repeat customer. The best gloves ever! I have tried the white. blue, black, even imitation purple Nitrile gloves but none of them compare to this one! Its the strongest gloves I have found made of rubber that is. I buy 2x 100 count boxes almost every month! I use it for car mechanical work, cleaning dust, working with glues & even swatting that pesky insect! Healthy Kin has the lowest price I have ever seen! I love them for that. Amazon.com? They are horrible, selling same item for double the price. Shop around & you will find amazon.com is not the best prices for items. Perfect fit!!! Love the color. Fast shipping! Great quality products! I t just doesn't get any better than Healthykin for no hassle ordering, super fast delivery and the order is always correct!!! 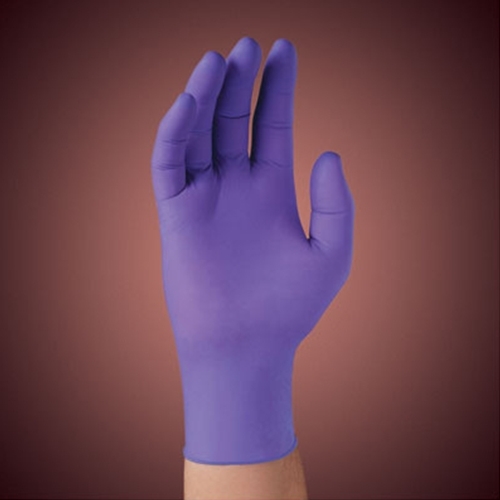 I love the Purple nitrile gloves because they are comfortable, durable and stand up to harsh chemicals. I am a nail tech and the acetone eats up everything else on the market!! These are the best!! Great gloves! I've ordered them several times. I've never had one tear on me while putting it on.